At the dawn of the Renaissance, the powerful medieval fortress of Amboise was slowly dismantled to gives way to a royal residence during the reigns of Charles VIII and François I. The Court, along with the literati and great scientific thinkers of the age stayed there at the invitation of the sovereigns, among them Leonardo da Vinci, who lies in the Château Chapel. This grand focal point in the history of France has an exceptional collection of Gothic and Renaissance furniture, testament to the artistic refinement of the first French Renaissance. After visiting the royal lodgings and climbing the towers, your walk continues in the beautiful panoramic gardens overlooking the Loire. The promontory on which the buildings stand have been an ideal observation post at the confluence of the rivers Loire and Amasse since neotlithic times. The elevation of nearly forty metres offers an exceptional natural defence. The city was once the high meeting place of the Turones, a Celtic people who gives its name to the future city of Tours. The site appears to have been fortified from this time onwards. Roman legions occupied the fortified site, and Julius Caesar (100–44 BC) himself was said to have been particularly interested in the the strategic value of Amboise. 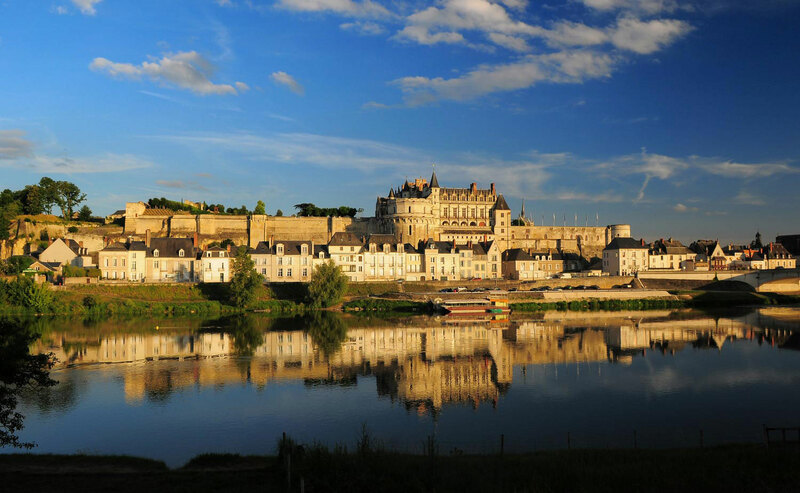 Amboise made its first durable mark on history as the meeting place of Clovis (481–511), king of the Franks and Alaric, king of the Visigoths. After the troubled period of Norman invasions, Amboise joined the domain of the counts of Anjou, and was governed by the House of of Amboise-Chaumont. In 1214, the Tours region was invested by Philippe Auguste (1180–1223), King of France. The family of Amboise-Chaumont then became a direct royal vassal. In 1431, Louis d'Amboise (1392–1469) was sentenced to death for plotting against the favourite of King Charles VII, La Trémouille. Although his sentence was eventually commuted, Louis had to give up the Château d'Amboise, which was confiscated for the Crown. It was then that the most sumptuous days of the château began, most especially under the reigns of the Kings of France Louis XI, Charles VIII and François I, who made Amboise a particularly rich centre of courtly life. The arrival in Bourges of Charles VII and his wife Marie d'Anjou marks the beginning of the court of the Kings of France in the Loire Valley. The queen preferred the châteaux of Loches and Chinon to the fortified Château of Amboise. Their son, Louis XI, meanwhile, made his residence in the Château de Plessis-Les-Tours (known as La Riche). However, he chose Amboise to be the residence of the queen, Charlotte of Savoy and the dauphin - the future Charles VIII - was born in Amboise in 1470. He built a new house and an oratory, leaning against the south wall, which was to become the chapel of Saint-Hubert. Charles VIII and his wife, Anne de Bretagne, made a lasting impression on Amboise. The attachment he had for the château of his childhood undoubtedly played a role in his desire to transform the old medieval stronghold into a sumptuous Gothic palace. Charles VIII is also considered to be the grand architect of the château, successively ordering the construction of two stately buildings and a chapel on the site of the oratory erected by his father. He also ordered the construction of two very large bridle towers (a planned third was not completed). These allowed horses and their carriages to drive up to the château terraces located 40 metres above the town below. Everything at Amboise is on an exceptional scale, and required a great deal of money, which continued to be spent on the project despite the costly French military campaigns in the Italian peninsula. Innovative techniques were developed to heat the stones and prevent them freezing in winter so that work could continue. The king called upon French masons and Flemish sculptors and, on his return from Italy, transalpine artists, carpenters, gardeners and architects. The château has 220 rooms. At the end of the sixteenth century, the role of Amboise as a fortified town continued to be particularly important due to its strategic position, becoming a stage on the courtly progress of the French sovereigns who stayed only occasionally during their movements around the kingdom. They included Henri IV, Louis XIII, Louis XIV and his grandson Philip, Duke of Anjou, the future Philip V of Spain. In 1620 Louis XIII ordered the construction of new defences. Unfortunately, due to a lack of maintenance, the Château deteriorated gradually and the main building of the western enclosure (between the Chapel Saint-Hubert and the Logis of Charles VIII) were demolished between 1627 and 1660. Amboise later served as a prison, where some prisoners famed in French lore were detained, such as Nicolas Fouquet (1615-1680), disgraced superintendent of finances of Louis XIV, held here in 1661. He was escorted by none other than the famous captain of the musketeers d'Artagnan during this stay. Amboise finally reawakened in the eighteenth century with Étienne-François, Duke of Choiseul, a powerful minister to Louis XV. He became the owner of Amboise and the nearby estate of Chanteloup in 1763, where he built a sumptuous château in the style of the time. He preferred to live there rather than in the citadel of Amboise where he installed his offices. Upon the death of Choiseul, his immense properties were bought by the Crown, passing in 1786 to Louis-Jean-Marie Bourbon, Duke of Penthièvre (1725-1793), the legitimised grandson of Louis XIV. He arranged apartments to be built from 1789 onwards, demolished the columns and the partitioning of the Great Hall, and had a panoramic dining room installed in the Minimes Tower. He ordered work in the gardens, planting the lime trees still present on the north terrace, and built an English-style park. At the western end of the fortress, he built a pagoda on the Garçonnet Tower in the Chinese style. In 1789, the Sept-Vertus logis accommodation wing suffered a fire. The French revolution changed the destiny of the château. In 1793, the authorities confiscated the buildings and all the furniture. It became an austere detention centre as well as a barracks for veterans of the campaigns of the revolutionary armies. During this period most of the decoration of the Château disappeared - panelling, fireplaces, statues, paintings, ironwork and carpentry. Having abandoned their faint hopes of recovering her property, the heiress of the Duke of Penthièvre, Louise-Marie-Adelaïde, Duchess of Orleans, went into exile in the wake of the Republican decree obliging the Bourbons to leave France. The Consulate government (1799-1804) and the Empire (1804-1815) opened a new page in the life of the Château. In 1803 Amboise was gifted to Senator Roger Ducos (1747-1816), former member of the Directorate, by First Consul Napoleon Bonaparte for his help in his rise to power. In 1806, to renovate the Château, the Senator ordered the demolition of all buildings in ruins (the logis destroyed in the fire and the adjoining buildings) or which had become useless. He notably knocked down the Henry II wing and the Church of Saint-Florentin (a building from the 11th century) as well as the canonical house. The garden was also extensively remodelled. All this work was completed by 1811. In 1814, during the first restoration of the royalty, the Château was returned to the heiress of the Duke of Penthièvre, Louise-Marie-Adélaïde Bourbon, Duchess of Orleans (1753-1821) having returned from her Spanish exile. After the temporary return of Napoleon (known as the Hundred Days) Amboise briefly once again became a prison fortress, before finally being returned to the family of Orleans in 1815. When she died, the Duchess passed the Amboise estate on to her son Louis-Philippe, future king of France. 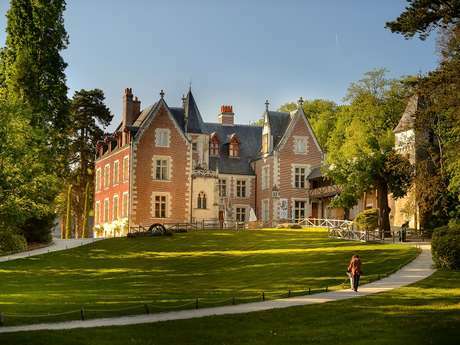 He had renovations carried out to transform the château into a holiday resort. These works were entrusted to the renowned architect Pierre-François-Léonard Fontaine and his apprentice, Pierre-Bernard Lefranc. King Louis-Philippe was an ardent defender of French heritage, and supported the classification of the emblematic buildings of national heritage as national monuments, among the first of which was Amboise, classified in 1840. The Revolution of 1848 sent Louis-Philippe I into exile, and the château of Amboise was placed under sequestration. Once again serving as a prison, Emir Abd el-Kader (1808-1883), deposed leader of the Algerian rebellion, was imprisoned here with his retinue in November 1848. The promise made to the Emir upon his surrender, to be sent back to Islamic lands was honoured four years later by President Louis-Napoleon Bonaparte serve the Emir his liberation papers in person at Amboise in October 1852. The Emir left France for Brousse, Constantinople and then Damascus (Syria). He left behind him sincere friendships with the people of Amboise along with the memory of 25 members of his entourage who died and were buried at the Château. A mausoleum was built for them in 1853, and the "Garden of Orient" designed by Rachid Koraïchi, was planted on the site of the burials and the mausoleum in 2005. The fall of the Second Empire (1852-1870) and the advent of the Third Republic (1870-1940) saw the return of the property to the heritage of the Orleans family. A vast program of restoration of the château was initiated by Philippe (1838-1894), Count of Paris and grandson of Louis Philippe I. The château was once again listed as a historical monument, and the State department designated an architect to head the work. Victor-Marie-Charles Ruprich-Robert (1820-1887) and his son Gabriel after him, both inspectors of historical monuments, carried out remarkable restoration work on the Saint-Hubert Chapel, the Charles VIII logis and the Minimes Tower (1874-1879), then the Renaissance wing (1896- 1897) and the Heurtault Tower (1906). The Duke of Aumale also supervised certain works before he died in 1897, and the château, which already housed a hospice, was transformed into a dispensary for the former servants of his family in 1901. The Château d'Amboise was incorporated into the civil society of the Domaine de Dreux, created in 1886 to manage the historical heritage of the Maison de France. The last tragic episode for the Château and the city of Amboise was to take place during the Second World War. From September 4, 1939, the château was requisitioned, even though access to the chapel and the walkway of the Heurtault Tower was kept open to the public until May 22, 1940. IIn June 1940, the French army was in full retreat to the south of the Loire. From 4 to 15 June 1940, the royal residence of the château briefly became the seat of the Ministry of the Air, which then continued its retreat to Bordeaux. On 18 and 19 June 1940, a regiment of Senegalese riflemen resisted the German troops with remarkable bravery at the entrance of Amboise. The material damage was extensive (a hundred shells fell on the château) and the Chapel, the Garçonnet and Minimes towers all suffered badly. After the evacuation, the château suffered 15 days of non-stop arrivals of refugees and German troops. It was then used by the occupation troops as a weapons warehouse and a communications and air detection station. In July 1944, allied bombing damaged the facades, stained glass and roof of the Saint-Hubert chapel. On August 1, 1944, the château was finally deserted by the last units of the German army. An inventory of the damage was made a few days later. The state supported the campaign of restoration, which started in 1952. The Civil Society of the Domaine de Dreux became the Saint-Louis Foundation in 1974 following changes to the legislation regarding the management of cultural property. The Foundation launched a major program of restoration.